For our partners Don Schumacher Racing, Team Penske, Bryce Menzies and Rhys Millen, 2016 was a year of dominance. That means there’s been a lot to celebrate at Pennzoil this year. Even though NHRA, IndyCar, NASCAR and off-road races share similarly loud, thundering thrills, the engines inside the awe-inspiring vehicles have major key differences. However, they all have one thing in common – they need the right motor oil to power them to victory lane. In drag racing, vehicles are equipped with 10,000 horsepower engines that run for a fiery three seconds to reach 330 MPH on 1,000ft dragstrips. Out of every NHRA team this year, Don Schumacher Racing’s star burned the brightest – and we are proud to have Pennzoil® PurePlus Technology™ costar in all of Don Schumacher Racing’s Funny Car and Top Fuel engines. In addition to racking up records and wins, Don Schumacher Racing swept the NHRA Nitro Class World Championships with Antron Brown and Ron Capps taking home the hardware in Top Fuel and Funny Car. In IndyCar racing, 2.2-liter V-6 turbo engine rigged vehicles zip around city circuit bends and oval tracks alike with 600 horsepower and speeds that top out around 230 MPH. Team Penske’s Indy Car team enjoyed a sweep of its own with drivers Simon Pagenaud, Will Power and Helio Castroneves finishing 1-2-3 in the final standings. All of their engines are powered by the same Pennzoil Ultra Platinum™ with PurePlus Technology™ you can grab off the shelf. In the oval-running NASCAR races (as well as two annual road course races each year at Sonoma and Watkins Glen), drivers push their 5.7-liter V-8 engines with 800 horsepower around and around for hundreds of miles. Enter Joey Logano and his incredible run throughout The Chase for the NASCAR Sprint Cup Series Championship that ended in a thrilling 2nd place finish after narrowly losing out to 7-time champion Jimmie Johnson. Despite the loss, Logano proved time and time again in 2016 that he is one of NASCAR’s top drivers with statement wins at Michigan, Talladega and Phoenix as well as 16 top five finishes and 26 top ten finishes. Pennzoil® PurePlus Technology™ was there to power the No. 22 Ford Fusion’s engine through every lap. Now, to the off-road racing circuit, where racers are thrown into constantly changing environments far from the relative safety and comfort of traditional race tracks. In the short course discipline, Pro2 and Pro4 trucks equipped with 900+ horsepower and, in the case of Pro4 trucks – four-wheel drive – battle brutal tracks in varying conditions. These range from the sweltering heat of the Nevada desert all the way to the freezing temperatures found in Maine for Red Bull Frozen Rush, where Bryce Menzies defended his 2015 victory by becoming back-to-back champion in 2016. 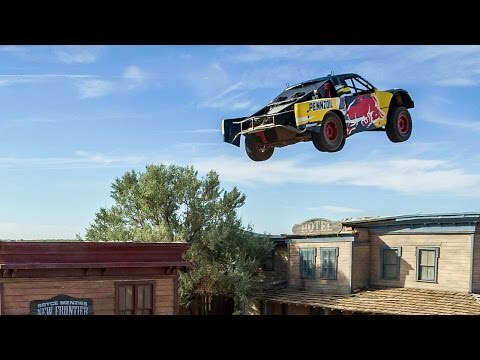 In addition to that, Pennzoil powered Bryce Menzies and his Pro 2 truck to a Guinness World Record by jumping 379.4 ft. jump over a Southwestern ghost town, in Bryce Menzies New Frontier powered by Pennzoil® Synthetics. From sand dunes to ski slopes and even through the air, Bryce Menzies counts on Pennzoil Platinum® Euro Full Synthetic motor oil in his vehicles to push him through all of his races and athletic feats. In the 2016 Score International Baja 1000, Rhys Millen and his RZR XP 1000 EPS earned the top honors in the Pro UTV (naturally aspirated) class by beating out all 16 high-powered starters in his division, as well as taking the overall Pro UTV victory by outpacing 20 starters from the faster Pro UTV FI (forced induction) class. To add to his success Millen took his unenviable starting position of 220th out of 279 total competitors all the way to an impressive 34th overall finish. His vehicle is designed for extreme performance with all-wheel drive and a Polaris ProStar® 1000 engine with 110 horsepower. We are proud to say that Rhys Millen relied on Pennzoil 10W-40 motor oil and Pennzoil Platinum™ 75W-90 gear oil to power him through one of the most grueling races in the world. · An IndyCar championship and podium sweep. · World record breaking truck jump. The results speak for themselves. Next time you need an oil change, Make the Switch to Pennzoil® Synthetics – the motor oil born from natural gas that powers championship-level performance.